Mary Helen Watkins departed her life on Friday, November 30, 2018. She was born on April 9, 1932 to the parentage of the late Charlie Haliburton and Jennie Whitfield. She accepted Christ as her Savior in her youth and joined Brown Chapel C.M. E. Church at the age of ten. Mary loved the Lord and was a faithful servant of God. She served well on the Usher Board, sang in the church choir, and presided on the Stewardess Board. She also served as the Mother of the Church. Mary received her education in the Macon County Public School System. She worked for many years at the Perry Veneer Factory. Her other places of employment included housekeeping services for Dr. Weems, Holiday Inn, Howard Johnson, and several years of child care services for many families. Mary will always be remembered as a woman with a "heart for people". The power and strength of her love was special to those who knew her. She enjoyed cooking, and sharing her wisdom with others. 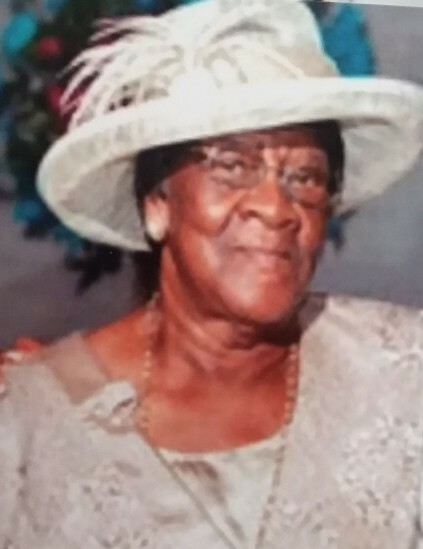 Mary was preceded in death by her husband Sylvester Watkins, two sons Sammie Watkins and Kenneth Watkins, both of Warner Robins, GA.
Left to cherish her precious memories are three daughters, Mary Lou (Edward) Simon, Geraldine Davis, and Kimberly (Kevin) James, all of Perry, GA. Four sons, C. L. Watkins, Paul (Cheryl) Watkins, Nathaniel Watkins, all of Perry, GA. and Donald Watkins, Atlanta, GA. Two sisters, Rebertha (Henry) Cosby, Perry, GA and Beatrice (Gene) Carroll of Warner Robins, GA. One brother, Earnest Barrett of Perry, GA. Two loving buddies, Ossie King and Gloria Oliver, 20 grandchildren, 12 great grandchildren and a host of nieces, nephews, cousins, other relatives and friends.